Now nearly two weeks since the deadly mass shooting at Tree of Life Congregation synagogue in Squirrel Hill, Pittsburgh Mayor Bill Peduto says he'll lean on interfaith prayer vigils to give space for collective healing and grief. Pittsburgh took the national stage after a gunman killed 11 Jews and injured six others in what prosecutors have dubbed a hate crime at the Tree of Life Congregation synagogue in Squirrel Hill. 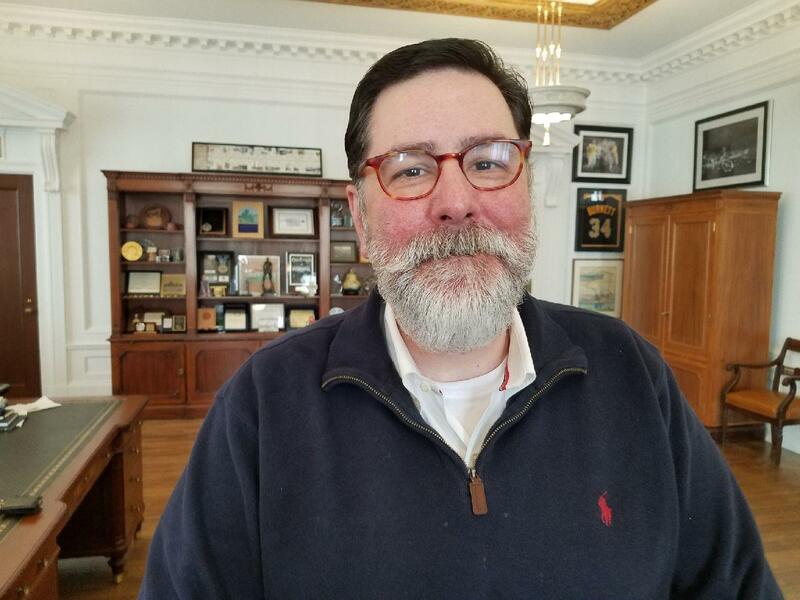 Mayor Bill Peduto poses in his office in Downtown Pittsburgh on Monday, Nov. 5, 2018. When the news broke, Mayor Bill Peduto says he filled the dual roles of city spokesman and consoler in chief. Now nearly two weeks later, he says it's time to turn to action. "I've been in homes where the life was lost and the blood was still on the walls. It comes with the job," he says, but what happened at Tree of Life was different. "You always hope you will never be that city that has a mass loss of life. ... It's the committee that no mayor wants to be on." Peduto says he hopes various interfaith prayer vigils continue across the city as a vehicle for unity and healing. Elsewhere in the program, the alleged gunman, Robert Bowers, pleaded not guilty in court last week. David Harris, 90.5 WESA legal analyst and professor of law at the University of Pittsburgh, says it may seem counterintuitive, but his defense is to be expected -- as are the two taxpayer-funded public defenders representing him. The aeronautics industry is facing a worker shortage that could outstrip supply within the next decade. WESA’s Maria Scapellato talks to Suzanne Markle, CEO of the Pittsburgh Institute of Aeronautics, about federal legislation passed last month creating a $5 million grant to fund workforce development and boost the number of trained aviation mechanics and technicians. Markle says PIA is up for the challenge. 90.5 WESA’s Virginia Alvino Young reports on the contracting Catholic diocese, and what Pittsburgh's is doing to recruit and consolidate amid a sweeping clergy abuse scandal. And Gov. Tom Wolf recently signed into law two bills aimed at helping the innocent exonerate their wrongful convictions. Marissa Boyers Bluestine, executive director of the Pennsylvania Innocence Project, says it's a huge and welcome change, but more needs to be done. The Confluence, where the news comes together, is 90.5 WESA’s daily news program. Tune in weekdays at 9 a.m. to hear newsmakers and innovators join veteran journalist Kevin Gavin, taking an in-depth look at stories important to the Pittsburgh region. Find more episodes of The Confluence here. Google is promising to be more forceful and open about its handling of sexual misconduct cases, a week after high-paid engineers and others walked out in protest over its male-dominated culture. Seven Roman Catholic dioceses in Pennsylvania said Thursday that they have taken steps to set up victim compensation funds, nearly three months after a chilling grand jury report documented decades of child sexual abuse by priests in the state. The Philadelphia, Harrisburg, Scranton and Allentown dioceses issued public announcements, and a lawyer for the Greensburg Diocese said it is also involved. The Erie and Pittsburgh dioceses said they were setting up funds but were not ready to disclose details. Altoona-Johnstown said it set up a victim fund in 1999. A few of Pennsylvania’s state House and Senate races still aren’t finalized, but it appears legislative Democrats have picked up at least five new seats in the Senate, and 11 in the House. High voter turnout, a record number of female candidates and vastly different messaging between the two major parties loomed large over Tuesday's midterm contests.